The streets of downtown Salina were alive with the spirit, and color of St. Patrick’s Day Saturday night. Salina Downtown’s “St. 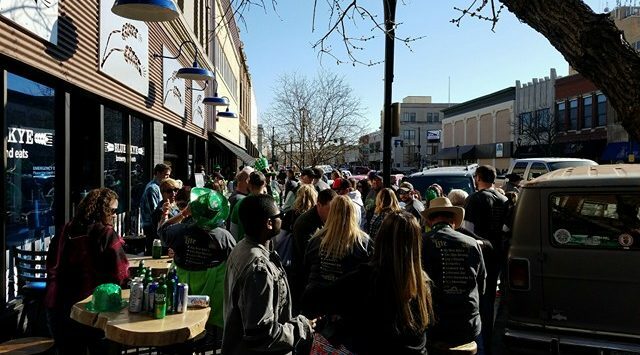 Paddy’s Day Pub Crawl 2018” event attracted a large crowd of enthusiastic revelers. Many dressed in bright, festive, green attire and were enjoying their favorite cold beverages. Each participating business offered food and drink specials exclusive to pub crawlers. For those that might have had a little too much to drink, Sunflower Taxi offered free rides home. Pub crawl events in downtown Salina are proving to be popular. Saturday’s St. Patrick’s Day pub craw was the fifth. The success of the St. Patrick’s Day events prompted the creation of simialr Halloween themed “Zombie Crawl” events which are just as popular.